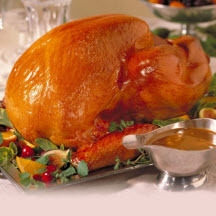 Looking for festive menu ideas and foods for Thanksgiving dinner? You'll find them here! We've gathered together a cornucopia of traditional and nouveau foods for Thanksgiving Day dinner to help you plan a memorable holiday meal worthy of a celebration feast of thanksgiving. The classic autumn flavor of apple permeates this turkey inside and out — from the chopped apple, pecan and cornbread stuffing to the apple juice and jelly glaze. 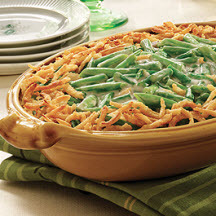 The Campbell's Soup Company test kitchens developed and introduced this original recipe for the classic traditional green bean casserole back in 1955. Nothing says Thanksgiving dessert like pumpkin pie! It's as traditional as it gets, and always a good choice for the holidays.